I'm trying to turn over a new leaf and not put everything off until the last minute so I've spent the week finishing up my handouts for the meeting in Indianapolis and organizing my swatches. Over the years I've created quite a stockpile. This requires much more work than you would think. I am doing a few things differently this year which also requires work. Last year when a student showed up with black eyelash yarn to use in class I made the decision I would put together yarn kits for all of my classes. This will be a major pain for me. I also am taking my projector so I have to organize all of the photos for the classes and get them on my iPad. I'll have to see if this is worth it for next year! If I thought last week was slow, I was mistaken. Not a single lesson arrived! I've gotten several messages saying lessons are on the way so I expect next week will bring a change. By the way, I will be out of town July 16-21 for the conference in Indianapolis. I will be able to process new orders but any lessons that arrive will have to wait until the 22nd. 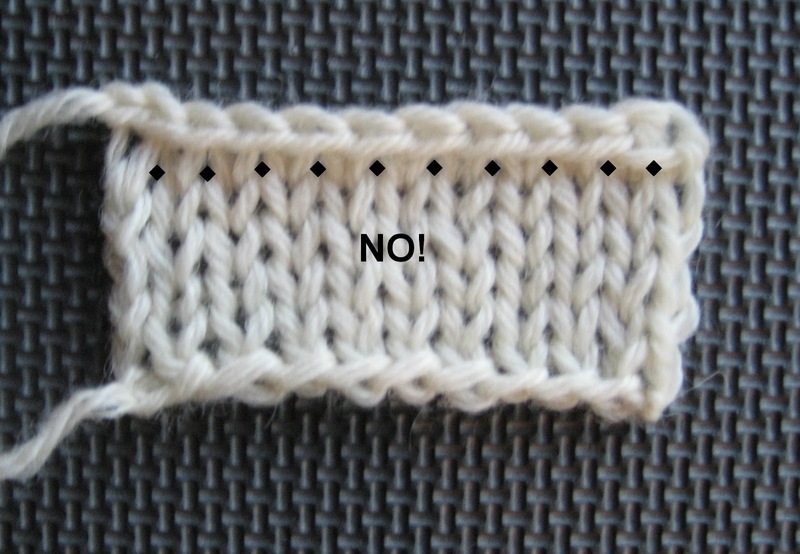 This week's tip is something that I am very fussy about...probably because I did it wrong for so many years (and I have the sweaters to prove it). 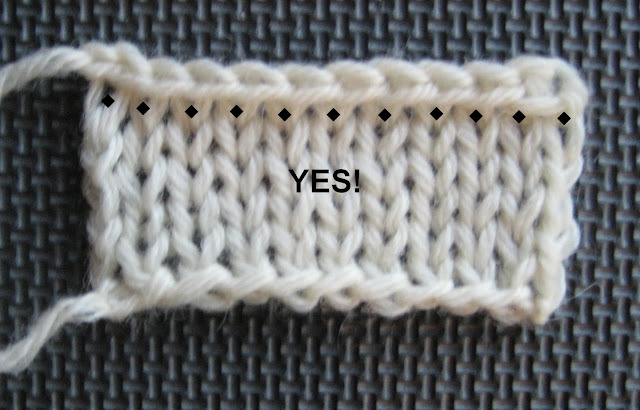 When you pick up stitches along a horizontal edge (bound off edge) you pick up ONE stitch for EVERY column of stitches. (In upcoming weeks I will do tips for picking up stitches on vertical edges and curved edges.) 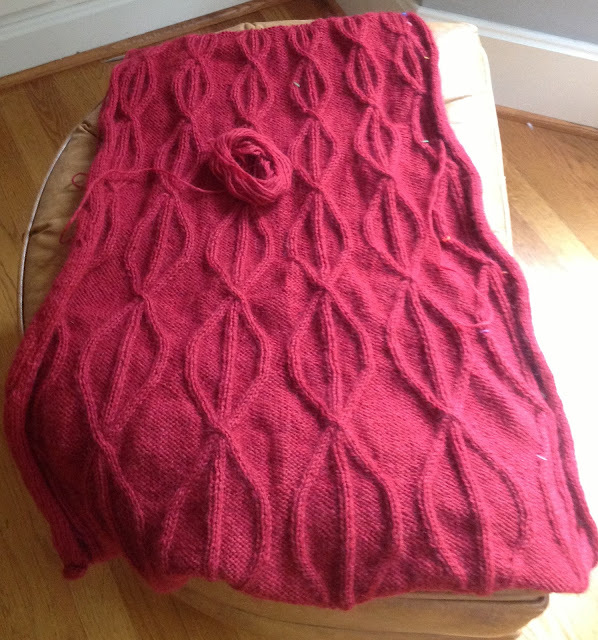 Many new knitters, when looking at a bound off edge say, "Isn't that convenient! 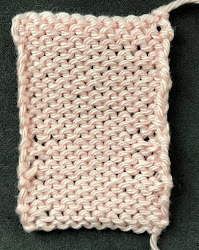 Those nice little loops at the top are perfect for picking up stitches." 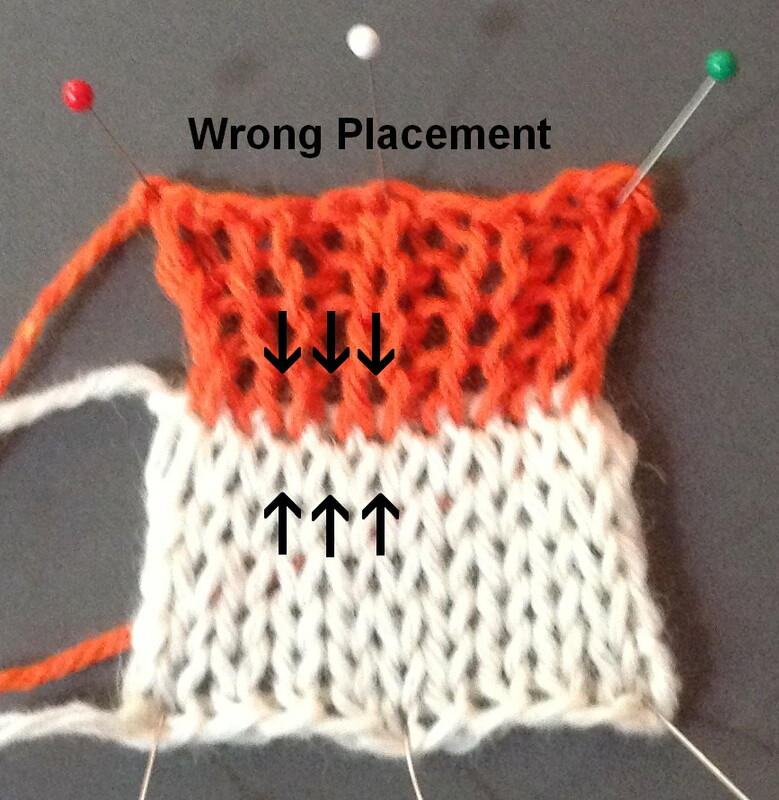 The problem with this is that the stitches in the band should line up with the columns of stitches in the fabric. If you use the bound off loops, that will not happen. The loops actually span the spaces between stitches, not stitches themselves. The two photographs below show the right and wrong locations for picking up stitches. This photograph shows a band picked up properly. (I used super large needles so you can see the stitches clearly.) 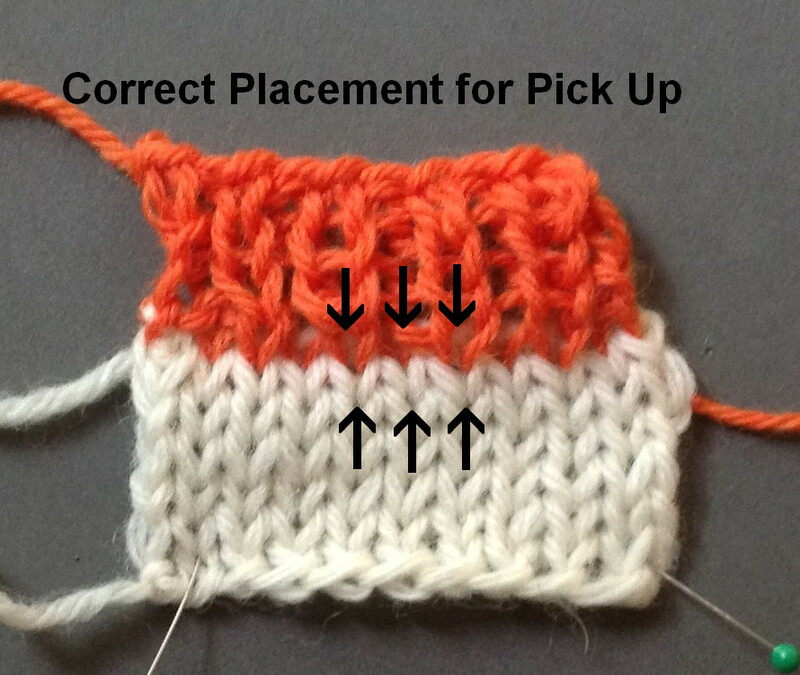 Notice how the white stitches in the body of the swatch line up perfectly with the orange stitches of the band. It is small details like this that make the piece look professionally finished. This photograph shows a band picked up incorrectly. The stitches in the body line up with the spaces between stitches to create the "dread 11s". ICK!! As I've said, I did this routinely until I was forced to research the topic for Level 2 of the Masters Program. I have to drive up to the Cincinnati airport tomorrow afternoon so Salon will be earlier...10am-1pm. I need Sunday to make some headway on my preparations for Indianapolis. My time this week has not been my own. I am almost finished with the back of the Caduceus coat. It is long...38". I am just about ready to shape the armholes. Again, the color in this photograph is completely wrong. It is red. Arenda, can't wait for the Caduceus coat ! That looks gorgeous.